Merry pre-Christmas everybody! Is everyone ready for the big day tomorrow? I still have a couple of gifts to wrap, but other than that everything is sorted and ready for Turkey Day! I'm taking Christmas a little easier than usual - I've only made Christmas puddings and one batch of Vanillekipferl this year; no Christmas cake or mince pies - but we did have a super-duper deluxe blowout meal at my parents' house two nights ago. You may remember I previously said I wanted to make my own version of the uninspiring New England Lobster Rolls I tried at Golden Fields earlier this year, and the menu was built up from that idea. (Granted, I've only tried a canapé version of their famous rolls, not their standard version which has so caught the interest of Melbourne's dining public). 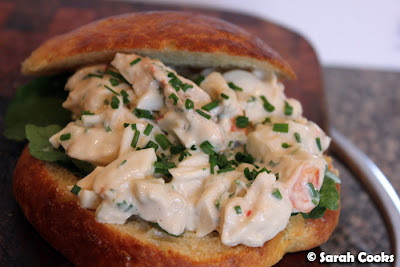 I based my lobster rolls on this recipe from Gourmet Traveller, and baked my own brioche buns for it. I'll be making them again next week for another dinner for friends, and will devote a whole blogpost to them soon! Lest you think I've got money to burn on lobster, let me tell you about a sweet deal I've made with lots of my friends: if they agree to supply fresh lobster, I'll make us lobster rolls. Pretty cool, huh! The rest of the menu continued the "luxury" theme with a beautiful leg ham from Andrew's Choice Butcher in Yarraville, which I glazed in gingerbread spices and served with a cherry relish (a recipe from Snowflakes and Schnapps). 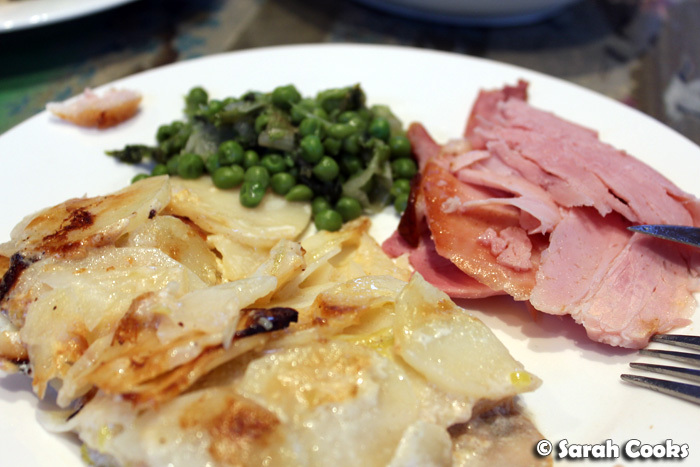 The accompaniments were my favourite peas (a Nigella recipe), and Martha Stewart's scalloped potatoes with leeks, which we thought would make a good change from my usual ham-accompaniment of mac & cheese. For dessert, I wanted to try my hand at making a dessert I tried at Il Fornaio last year: Phillipa Sibley's Poires Belle Hélène, from her new book PS Desserts. I actually received a review copy of PS Desserts from the publishers, and I intended to post the recipe for Poires Belle Hélène here on my blog. However, I encountered a few little kinks with the recipe, and don't think it's the most user friendly recipe to try at home. Once I've worked my way through the book a little more I'll find a better recipe to share with y'all! Phew! 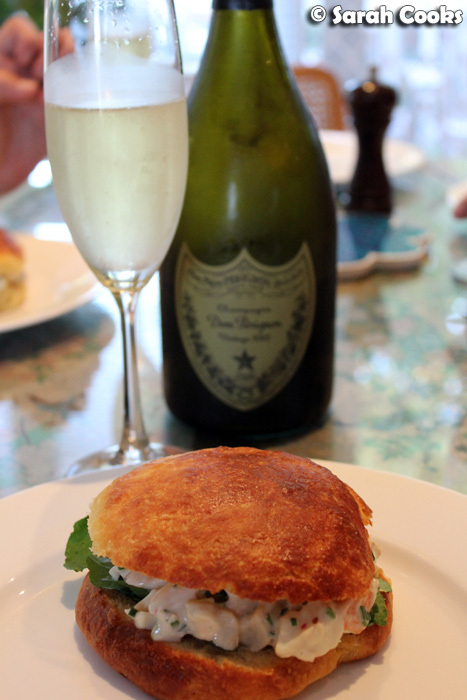 I'm getting tired again just writing about the menu! It was a lot of work - a two-person job spread over two days (thank-you Sandra for all the help!) - but worth it for such delicious results. 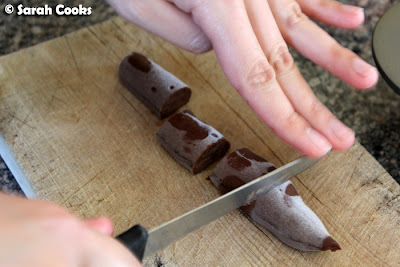 Let's start with the dessert, as this was the first thing we had to prepare - most of it was done the day before. 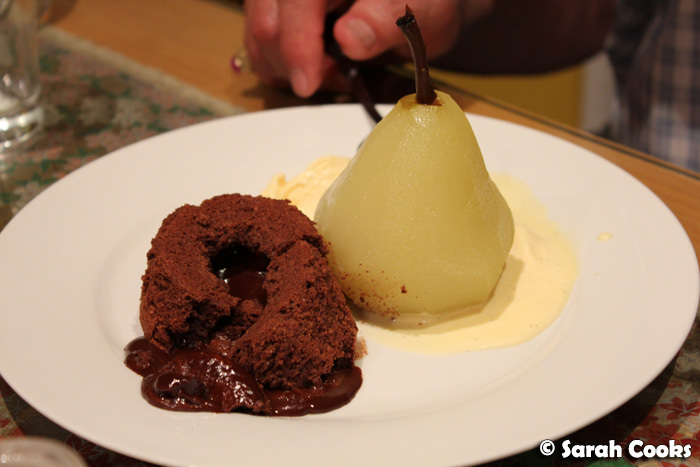 It was definitely the most difficult thing on the menu - there were pears to poach, vanilla ice-cream to churn, chocolate sauce to pipe and chocolate sponge to make! 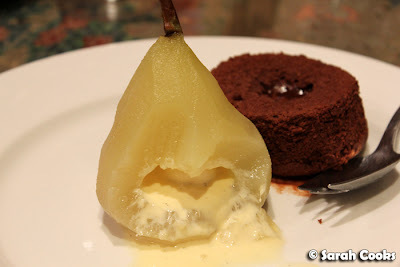 If you've tried this dessert before, you'll know that the ice-cream is piped into the poached pears, and the chocolate sauce is frozen in logs, then baked inside the chocolate sponge, for two sweet surprises at the table. 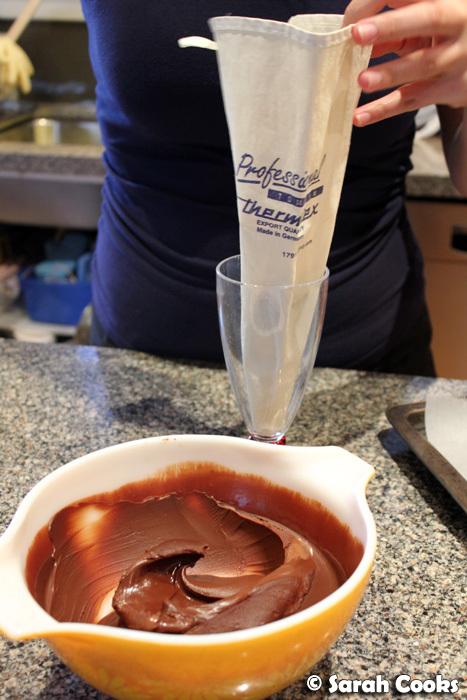 Piping lines of chocolate sauce - don't laugh, I know what it looks like! Various mixtures that go into the chocolate sponge. 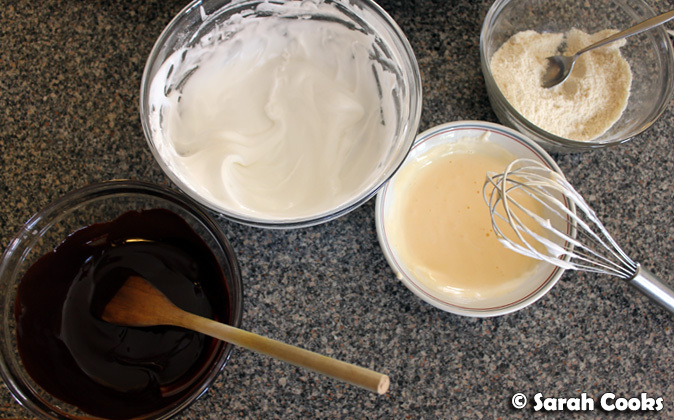 I whisked the egg whites by hand! As I mentioned above, I had some issues with the recipe - the most important of which was that it made way too much chocolate sauce. With the quantities given, I got about 15 logs of chocolate sauce - and I only ended up needing two of them! 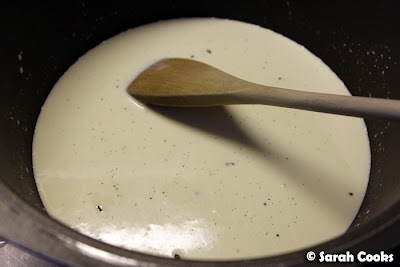 There's no mention anywhere in the recipe that it makes more sauce than you'll need, and looking at the quantities, they could easily be scaled down. It did taste delicious though (especially straight out of the freezer! 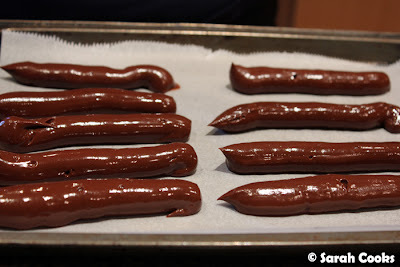 ), so I'm keeping them for future snacking or for melting over ice-cream. The other issue I had (which was my fault) was that the recipe asks you to bake the sponges 4.5cm in diameter, and I only had 8cm moulds, so I was only able to get four flat sponges out of the mixture rather than the six tall ones that the recipe says it will make. 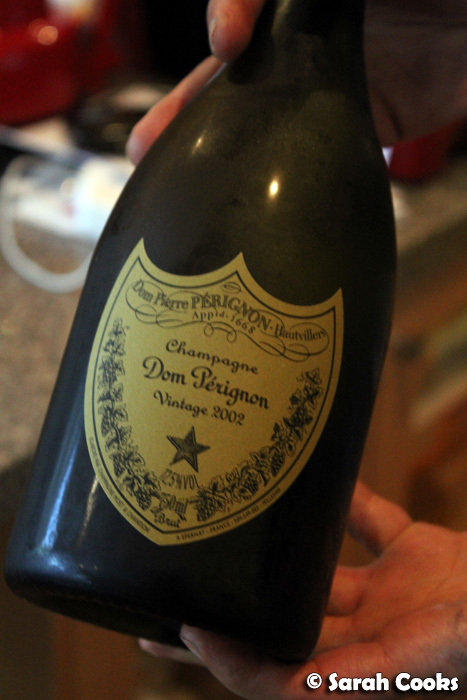 (And there were five of us eating that night - d'oh!) 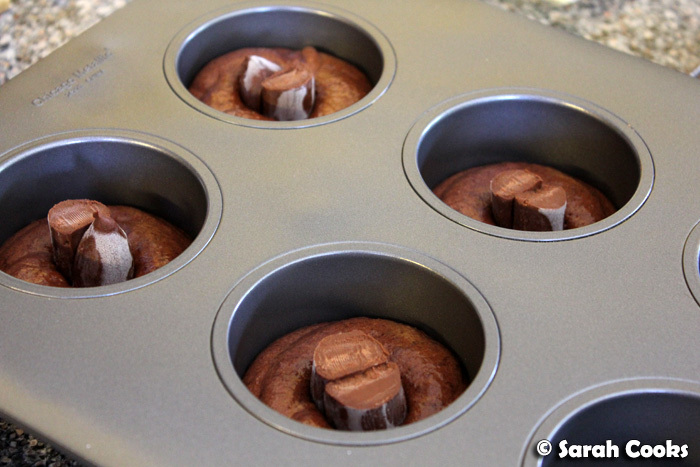 I know that baking is an exact science and that the recipe would have worked better if I'd used moulds in the correct dimensions. However, I must admit I found it a little frustrating that the chocolate sponge recipe was so precise, when the chocolate sauce recipe made so much more than required. The puddings are quite rich though, so we were happy to share. So, the sponges went in the freezer, and the custard and pears went in the fridge, ready to be finished off just before eating. 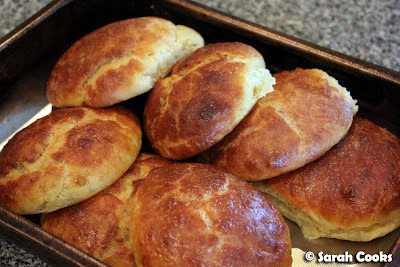 The other thing I did in advance was to bake the brioche rolls, using this incredibly easy recipe. Everything else we prepared in the afternoon before the dinner! 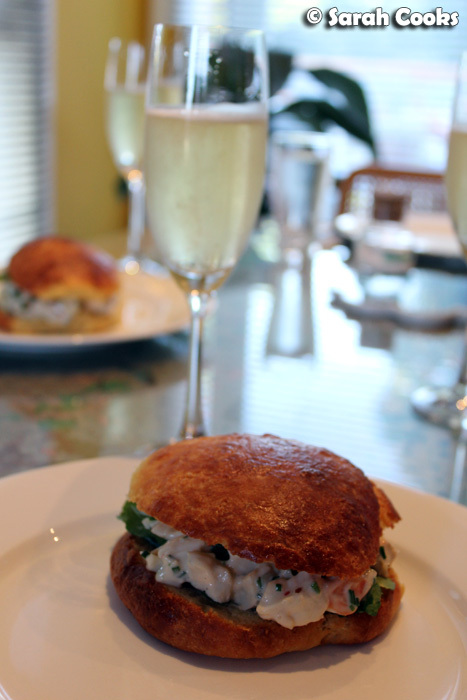 And then finally... everything was done and we could crack open the champagne and eat! Cheers! One tail made more than enough filling for us, which I suppose makes it an economical way to enjoy lobster?? Hehe. 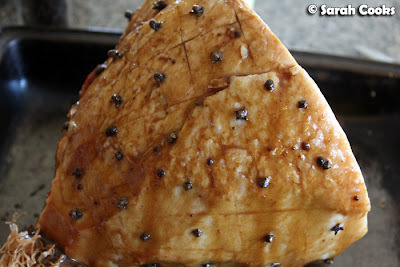 The ham was gorgeous - and I'd expect nothing less from Andrew's Choice! 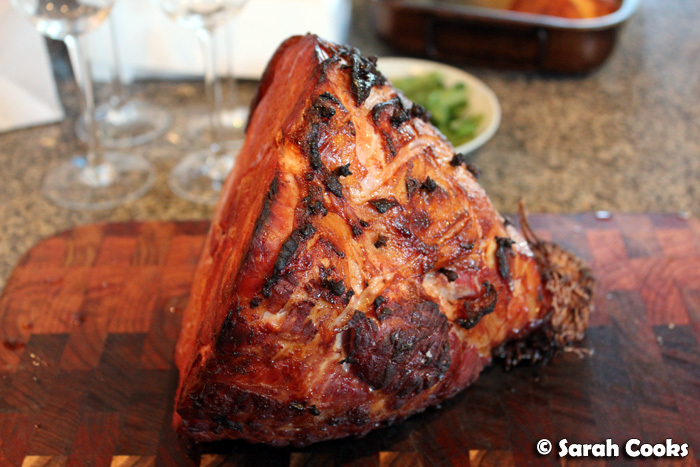 We've got quite a bit of ham left... yay leftovers! 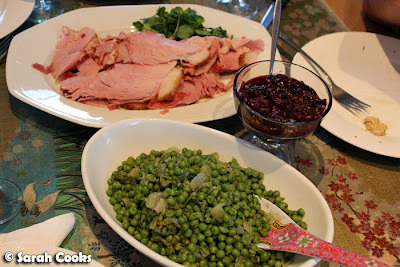 I daresay I like the spicy, sticky cherry relish even better than Nigella's spiced peaches, which used to be my usual accompaniment for ham. The scalloped potatoes were amazing! Somehow they tasted light, with no feeling of stodginess or heaviness. 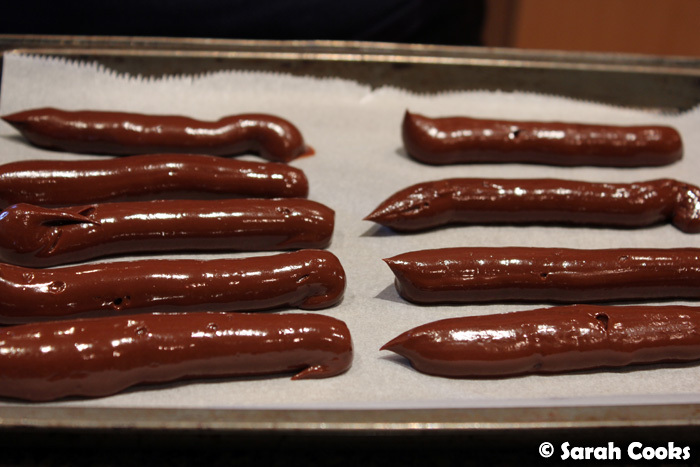 A great recipe from Martha Stewart! 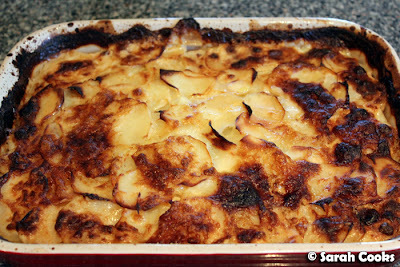 I must confess that scalloped potatoes are one of my favourite foods ever. When I was a kid, whenever we'd go to buffets, I'd always make a beeline for the scalloped potatoes, while everyone else was getting stuck into the more expensive oysters and prawns. I even liked them made with the MSG and salt-laden flavour packets you can get at the supermarket! As I mentioned above, there was still a little work to do for the dessert: about 20 minutes before we wanted to eat (and after all that food, we definitely needed a little break in between courses! 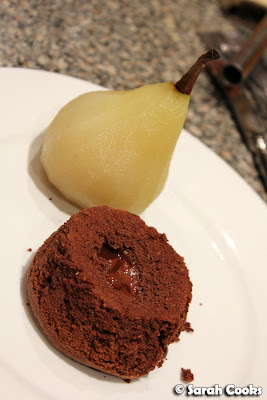 ), we churned the ice-cream, popped the puddings in the oven, then piped the ice-cream into the pears. My puddings didn't look quite like Philippa's perfect towering version, but I was proud of them nonetheless! 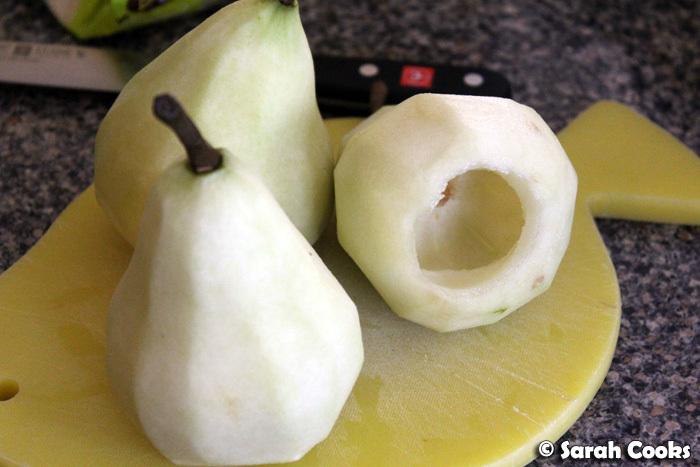 It was so nice to hear my mum exclaim: "Oh wow, there's something inside the pear!" I totally understand it when Philippa writes "I love surprising people". You'll see that I created a much bigger cavity in my pears than in the ones at Il Fornaio - more room for ice-cream! Yum yum yum! My favourite part of this dessert was the pear - perhaps for an easier version in future I'll make the ice-cream-stuffed pears and just drizzle them with the chocolate sauce.